This question is the first that new growers should ask before buying any orchid. Often there’s no straightforward answer. Some areas of Melbourne regularly experience quite severe frosts, whereas coastal suburbs seldom see a frost from one year to the next. Also, a ‘cosy’ shade house fitted with a fibre-glass or plastic roof and solid walls on the southern and western sides will be a much warmer proposition than an open shade house exposed to howling winds on stormy nights. Many orchid books indicate whether an orchid should be grown under warm (minimum temperature 15°C), intermediate (min. temp. 12°C) or cool conditions (min. temp. 10°C). On this basis, it would be inadvisable to grow any of the orchids that they describe without heat in Melbourne, yet we know by experience that many can be grown perfectly well in an unheated shade-house. The reason that these orchid books err so heavily on the side of caution is that they are mostly written by American or European authors for regions where temperatures regularly fall below freezing point and all orchids must be grown in heated glasshouses during the colder months. 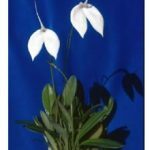 These books can provide us with a guide to which orchids to buy, in that some of those they list as cool-growing are likely to be suitable for our shade houses. An even better indication can be obtained from those books that give the altitudes at which particular species grow in nature. For example we all know that Coelogyne cristata grows and flowers quite well in a ‘cosy’ shade house in Melbourne. 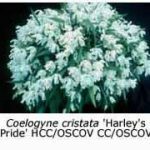 Therefore another species found growing in nature in the same region at similar or higher altitudes should also grow and flower under the same conditions that we provide for our plant of Coelogyne cristata. This information is not foolproof, however – a sheltered canyon will probably be much warmer than a windswept valley, even though both are at the same altitude, and orchids growing in the sheltered canyon may not thrive if regularly exposed to cold winds. However, comparison of the altitudes at which different species grow can provide us with a guide as to which species we might try to grow without heat. Trial and error will show us whether our initial guess is correct or not. Orchids do not usually die overnight – if a particular plant is declining, then move it to your kitchen windowsill or ‘lend’ it to a friend with a heated glasshouse until springtime. The book Orchids of India (T.K. Bose and S.K. 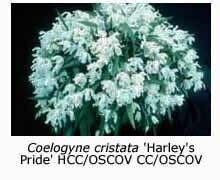 Bhattacharjee, 1980) tells us that Coelogyne cristata grows in the Khasia Hills at altitudes between 1700 m and 2000 m. Other coelogynes growing at similar or higher altitudes include C. corymbosa and C. elata (both at 2000-3000 m), C. longipes and C. oculata (both 2000-2300 m), C. ochracea (1700-2000 m) and C. nitida (1000-2000 m). 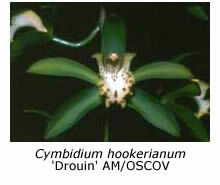 These species should therefore also grow happily along with your Coelogyne cristata. Although C. ovalis and C. fimbriata grow at slightly lower altitude (1300 m), experience shows that both these species (now considered by some to be synonymous) and also C. barbata (found at elevations of 1300-1700 m) grow without heat in Melbourne’s eastern suburbs. So watch out for these species at nurseries and on society sales benches during the show season. 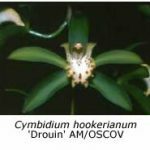 Other orchid species found in the Khasia hills at altitudes where Coelogyne cristata is found include Bulbophyllum cylindraceum (2000-2300 m), B. griffithii (3000 m), B. leopardinum (2000 m), Cymbidium devonianum (1700 m), C. hookerianum (1700-2500 m), Paphiopedilum insigne (1300-1700 m), Phaius tankervilliae (1700-2000 m) and also several erias, which are normally considered to be warm-growing orchids. 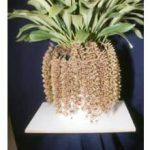 Most of the Indian dendrobiums that we grow ‘cold’ in Melbourne are found at lower altitudes than that at which Coelogyne cristata occurs in nature. 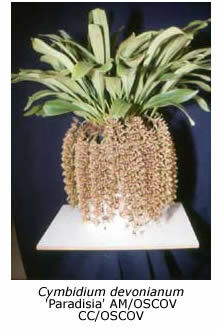 The reason that we can grow these orchids under cooler conditions than they experience in nature is that they are essentially dormant during the winter months; care should be taken to keep the plants fairly dry at this time to avoid rotting the roots and starting them into early growth during short warm breaks in otherwise cold weather. Examples of Indian dendrobiums that can be grown and flowered without heat (with varying degrees of success) are D. nobile (1000-1700 m), D. chrysanthum (1000-2000 m), D. fimbriatum (1500 m), D. aphyllum (syn. D. pierardii, 1000 m) and D. gibsonii (700-1700 m). In section Callista, D. densiflorum (1300 m) and D. thyrsiflorum (1200-2000 m) are suitable for shade-house conditions in Melbourne, but D. chrysotoxum and D. farmeri (400-1000 m) grow at lower altitudes and are marginal candidates. We can apply similar logic to the orchids of Guatemala. From experience we know that Rossioglossum grande can be grown and flowered without heat in Melbourne. In Guatemala it is found at altitudes up to 2600 m. Therefore its likely that the following orchids, found in the same general area, will also grow cold: Lemboglossum bictoniense (3200 m), L. majale (2600 m), Maxillaria densa (2500 m), M. curtipes (3000 m), M. cucullata (3300 m), Epidendrum porpax, E. ciliare and E. nocturnum (all 2000 m), Lycaste lasioglossa (2800 m) and Oncidium cavendishianum (2800 m). A word of warning. Orchids that grow at very high altitudes will certainly withstand the worst winter weather that Melbourne has to offer, but they may be unable to withstand our scorching summer weather. 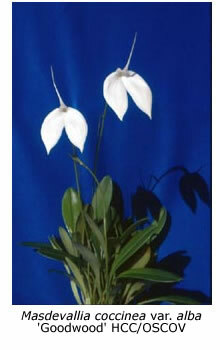 An example is Masdevallia coccinea, which grows at altitudes up to 4000 m in the South American Andes. It suffers badly in our summer heat, growing well during winter and then languishing during summer. Like other high-altitude species, it does best at temperatures at or below 20°C. An evaporative cooler can provide some relief to these species during summer but for best results air conditioning is needed – a very expensive proposition and probably unwarranted unless you intend to specialise in alpine species. Will it grow cool under your conditions? There’s only one way for you to be really sure, and that’s by trial and error.